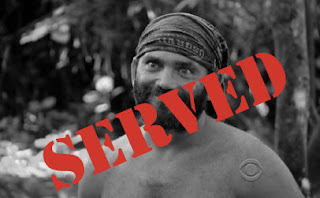 SERVED: Since September when Survivor: Samoa premiered, Russell was high on the list to get SERVED. The man wanted to make a "dumbass girl alliance," lied about being a Hurricane Katrina survivor and his dog drowning, and abused his tribe's well-being. He should've been out week 3, tops. But then it changed; Russell went from most hated to probably one of the best players ever. Russell's game, the lie, cheat, and steal, approach worked. He dominated the game and manipulated his way to the end. Watching the finale, I knew the million dollars and title of sole Survivor was his... until the jury voted. Russell's way of playing the game wasn't appreciated by the jury and he was SERVED; his partner Natalie, who he considered a coattail rider, won the whole thing. The man looked so devastated on the reunion and I think he was crying; all he wanted was the title of sole Survivor. Let's be honest, Russell was the best player but it's all subjective when you're on the jury. I didn't want to do it, Russell. We wanted you to win, but you got SERVED.